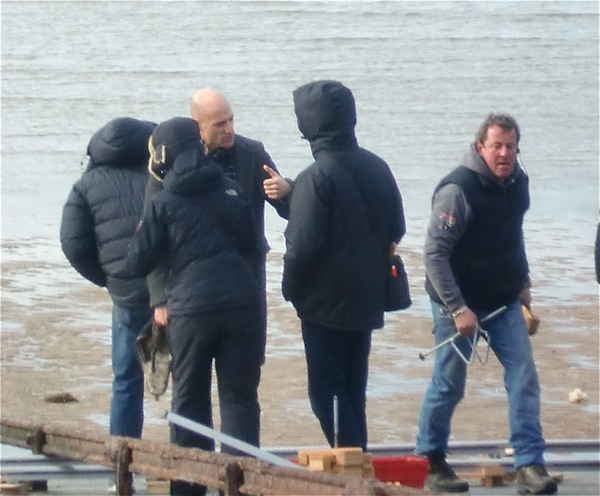 Many thanks to local film maker Frank Baker for sending me the above photo of actor Mark Strong on location at Red Rocks. Strong is one of the stars in the new film entitled Blood that is being shown at selected cinemas now and is out on DVD (at amazon). I’ve mentioned the filming of Blood a couple of times but never managed to see any of the actors. I’ve not yet seen the film, so no spoilers in the comments please! I did see something down at Red Rocks when the film crew were there so I’ve got an idea of at least one bit of the story line. And the DVD cover kind of hints at something happening on the beach and I don’t think we’re talking sandcastles with a moat! Frank captured the actors and film crew at work in Stanley Road in his video that you can watch over on Youtube. Frank’s current film project involves a member of a 60s band called The Moroccans who, according to a comment on the post about the old Hoylake bandstand, played live in Hoylake a few times. This 60s band member also has links (I think) to The Tornados (first UK band to top the charts in America) and an artist called Heinz who was produced by Joe Meek (another interesting person to google). Frank would like to hear more about The Moroccans band – so please do leave a comment if you have any recollections of them. Nick Murphy’s (The Awakening) pyschological thriller about two brothers, Joe (Paul Bettany) and Chrissie Fairburn (Stephen Graham), who collapse under the weight of their father’s shadow (Brian Cox). Desperate to fill their father’s shoes, Joe and Chrissie commit the ultimate crime, and the fear of being caught out by their police force colleague, Robert (Mark Strong), turns their lives into a downward spiral of guilt and paranoia. Was Robin Cartwright a member of the Moroccans??? he lived on the corner of the prom and Government Road????? This brings back my youth!!! We all well remember this Group,it will be interesting to see how many people from all the world send their memories. How many local groups of this era can we recall??? They were all good but did not have Brian Epstein to promote them. Of course I remember the Moroccans- was Robin Cartwright involved with them???? I expect many also remember that Freddie Starrs group the Midnighters had a Hoylake lad in the line up- Brian Wood. As Jackie says so many groups- some members I’m sure still playing and singing. Didn’t Brian Wood also play in a group called The Sputniks when they recorded Telstar? would take the stage at the Y to do a number we were dreadful! but overall the Moroccans were a good group to dance to. I didn’t know you had performed on the stage. Who were your partners? Yes they were a good band,I went out with Frank for many years,sadly he is no longer with us,We used to go Late Extra new Brighton,Melody Inn Wallasey,Royal Iris,YMCA,hoylake to name just a few places,Frank and I were involved in an accident one night coming home from late extra ,it happened on the bend in Village Road West Kirby,Frank’s injuries worse than mine.Happy memories. There were four of us all girls, Lesley Quilliam, Sue Price Val Gardner and me. Just borrowed my Son’s laptop to catch up with e-mails whilst on holiday, and checked out Hoylake Junction. I remember Lesley of course, you two were always joined at the hip, but I don’t recall the other girls. We are currently enjoying the beach at Hilton Head Island, South Carolina. The water temperature today is 79 F, and the temperature outside is 94 F. Hoylake beach will never be the same again. we would ever visit so many countries in the world. enjoy! Well Sandy, What can I say.. We are now back in Ohio, but we are off to Pittsburgh tomorrow for 5 days, and on returning to Ohio, we then shoot down to West Virginia for a couple of days, before flying home via Washington DC in a couple of weeks time. We will need a holiday to get over this one. I have just read all the comments about the Morrocans and the other local bands.very informative..I worked for a time with Frank at Jones’s in West Kirby.Brian woods was my mate.i knew Robin Cartright he sold trailers in the day and for the life of me I can’t remember the lead guitarists name but know he worked as a TV engineer at Prices in Hoylake.The last time I saw him he did a gig with Gus Travis at Heswall hall.he said he did gigs with his wife singing but I have forgotten his name old age?